With many of us hosting overnight guests this holiday season, it’s nice to plan not only that big, special dinner, but also a tasty and filling breakfast! This breakfast bake is another one of those recipes I “made over” by replacing a processed boxed mix with something more wholesome. In fact, you may even recognize this “real foodinized” version of Bisquick’s Breakfast Bake! This was actually a fairly easy dish to make over, and when you look at the ingredients on the back of a Bisquick box, it’s not hard to see why you would want to avoid it and use a homemade replacement instead. In The Box (Pictured): Enriched refined white flour (labeled as “wheat flour” without the word “whole”), partially hydrogenated oil (i.e. the same trans fat the FDA recently declared is no longer “generally recognized as safe for use in food”), and dextrose (a sweet additive I do not cook with at home). In My Recipe: Whole-wheat flour, unrefined cooking fat (from the pastured sausage), and other whole, recognizable ingredients. It’s funny to me how the Bisquick Breakfast Bake recipe tells you to drain the natural fat from the sausage just so you can add in their boxed stuff that contains unsafe trans fat. No, thank you! So anyway, whether you serve this for breakfast, brunch, or even dinner, I think you’ll find this is a super easy crowd pleaser, and with all of the cooking we’ll be doing during the holidays, that’s exactly what we all need! Preheat oven to 400 degrees F. Grease a square baking dish (8 x 8 inches or 9 x 9 inches) and set aside. In a sauté pan over medium heat, add the sausage, onion, and bell pepper. Cook while breaking up the meat with a spatula until the sausage is cooked all the way through, about 7 to 8 minutes. Transfer the meat mixture (including the fat) to the casserole dish and stir in the frozen hash browns and 3/4 cup of the grated cheese. In a medium sized mixing bowl, whisk together the flour, baking powder, salt, and pepper. Whisk in the milk and eggs until well combined but not overmixed. Pour over the sausage mixture in the casserole dish ensuring even coverage. Bake uncovered until light brown on top and around the edges, about 35 to 40 minutes. Sprinkle the remaining 1/2 cup cheese on top and bake for 2 more minutes. Serve with fruit for breakfast or with a salad for lunch. Enjoy! *To make this casserole ahead of time simply assemble, cover, and refrigerate before baking. You will need to increase the baking time by about 5 to 10 minutes when starting with a completely cold dish. As far as this recipes goes, I think GF all purpose would be fine since it is only a 1/2 cup. I am also GF but even more so. A lot of GF products have corn and potato of which I cannot have either BUT I found this and it rocks! http://www.namastefoods.com/ Happy eating! Thank you!!!! I will be making this for Christmas morning breakfast for family stopping by! Love that I can make this a day ahead! It sounds like the fat from the sausage is a necessary ingredient? Is there a replacement that can be used to make this a vegetarian dish? Maybe butter/ghee? Or coconut oil if you are vegan (use Spectrum Organic refined coconut oil if the taste of coconut bothers you). I think just any unrefined fat would work! Looks delicious- we’ll be making this for our Christmas breakfast this weekend! Is the bulk sausage a breakfast sausage, or would any bulk sausage do? I used breakfast sausage, but I think any sausage would do! Sounds great! Will be trying this for sure! Why buy hashbrowns when it only takes a second to shred potatoes in the food processor? Then you can use potatoes you grow or get locally. I agree on this point. I’ll be making this but with fresh shredded potatoes. I’ve tried replacing fresh shredded potatoes instead of frozen hash brown in another recipe and it did not go over well, but you can certainly experiment. I found organic frozen shredded potatoes that were only 1 ingredient – potatoes – so I felt good about that choice. Freshly shredded potatoes have a LOT of moisture in them, and that can make for a soupy dish. However, if you wring out the moisture in the freshly shredded potatoes before using them in the recipe, you may have a better outcome. Place the shredded potatoes in a dishcloth and wring. I’d love to see you “real-foodinize” Bisquick itself. There are recipes online for baking mixes, but they all seem to involve butter or dry buttermilk or similar stuff, and then they have to be refrigerated. To me the whole point is a pantry-shelf mix! :) I’m not motivated enough to do the math on scaling dry ingredients to a bunch of servings and figuring out how much is needed for biscuits vs. a dozen pancakes vs. whatever else. Thanks for the suggestion…I honestly never used Bisquick myself even in my “processed food” days so we shall see! My family found a recipe that called for Bisquick the other day that they really wanted me to make, and of course I didn’t have any (because I don’t keep that kind of stuff in my house.) I made my own with flour, baking powder, salt, and melted butter. It turned out great and without all the ingredients that you can’t pronounce! This recipe looks yummy and will be trying it very soon! Wondering how I could make this Gluten free? Would brown rice flour work in place of whole wheat flour? Bisquick has a GF version….and it doesn’t have Partially Hydrogenated oils. Is it possible to make a vegetarian version of this? And do maybe spinach instead of sausage? Could I maybe add some butter to substitute the fat or would that throw the constancy off? It looks so yummy!! You could certainly try, but something like diced bell peppers might be a better substitute. I would love to try making this and freezing individual servings for a hearty breakfast I could take to work. Has anyone tried freezing and reheating? Thanks. I make a similar dish and when I am making it for my breakfasts, I divide it into muffins and bake and then freeze. It heats up supper fast and is a great breakfast on the go! Looks yummy, definitely going to try it out! Do you know if the dry ingredients (flour, baking powder, salt- in the same ratio as in your recipe) would work as a sub for Bisquik in other recipes? Natasha – Bisquick also contains a fat (what is listed as the partially hydrogenated oil) so those items wouldn’t work alone. This looks so good can not wait to try it . Sheesh…. this is 100 days of real food, not 100 days of vegetarian food or 100 days of gluten free food. I’m sure you could all make your substitutes as needed or check out a vegetarian or gluten free site for recipes or tips. And not all of us can afford a nice food processor to shred our potatoes in seconds. Good for you if you can use freshly shredded potatoes. No need to sound pretentious about it. For real! The people that comment here crack me up! Do they read the other comments or the blog post first? I made this with organic frozen hashbrowns and it was delish! Loved by kids and adults. Oh, and this recipe sounds delicious as-is! This is the second home run recipe I have found on this site this week. The chocolate peppermint cookies were insane. INSANE. Definitely coming back here for more! Lisa, your blog is FANTASTIC. I think we are on the same page. No processed foods in my household either. Whenever possible local, organic, and no meat from tortured animals. Greetings from my blog to yours! Thanks for the great casserole dish. It looks like a keeper not just for Christmas. If shredding our own potatoes, do you think they need to be browned first ? Thinking otherwise it would be soggy on the bottom? Karen – As I mentioned I tried replacing frozen hashbrowns with fresh shredded potatoes in another recipe and it did not go over well at all! Has anyone tried this by making the night before? I’m afraid it would get too mushy overnight. I can’t get frozen hashbrowns here (England! ), and I’m pretty sure shredding fresh potatoes would just make it mushy…should I shred potatoes then freeze? or shred, cook them, and then freeze? I’d LOVE to make this for Christmas morning! I made this dish this morning for a large group and doubled the recipe. It was delicious and everyone LOVED it! Thanks Lisa for another hit! Lisa, here is my easy egg casserole recipe! 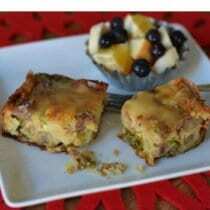 5-Minute French Toast Quiche! http://fresh-you.blogspot.com/2013/08/5-minutes-5-ingredients-my-new-favorite.html Merry Christmas! Same question as Patty: can this be put together the night before, refrigerated, and then cooked Christmas morning? I’ve made something similar with bread instead of potatoes but I’m wondering how this holds up when you do make it ahead of time? I tried prepping potatoes for a crockpot stew ahead of time and over night the potatoes that weren’t covered in liquid turned a terrible gray color… does this happen with the frozen hashbrowns? I do want to try prepare ahead of time but don’t want to wake up christmas morning to brown/gray unusable potatoes/casserole… Thoughts? Suggestions? Can I freeze this pre-baked? Making it today for Christmas morning and I don’t want to leave it in the fridge all that time. I don’t have sausage on hand. Do you think I could sub bacon for it? If I double the recipe, do I double the baking powder? Mr. Dell’s makes frozen potatoes that are only potatoes and non-GMO as well. I get them at Walmart. Does anyone know how I can make this gluten free? I know baking products are so different and I am just now learning…it’s tough, but I know I can do it. Any ideas? I used Red Mill’s All Purpose Baking Gluten free Flour and it was excellent. I used four eggs to stretch it. It fed six people and we had left overs. Thanks for the idea! My first thought would be Bob’s Redmill gf baking mix and Haines af and gf baking powder. I’m vegetarian – do I need to use something “fatty” in order for this to work or could I sub in more veggies? Looks like a good breakfast to wake up to! I defiantly want to make something like this! Is there a healthy remake to the “wheat free Bisquick”(using rice flour, etc) mix? I have two in my family that can’t eat wheat, not just gluten….thank you!! I’m just checking on the number of eggs. Is it correct that only 2 are needed? Just seems like a small amount to me. I have spelt flour, instead of whole wheat….is that going to be ok as a substitute? I just tried this and it was delicious. I used 1/2 lb of center cut bacon and it turned out great, the whole family enjoyed. Thanks! Just made this this morning! So good! Didn’t have whole wheat flour, so I used organic spelt flour. Had to use links as I couldn’t find bulk sausage, and used 1 cup from your Tortilla soup recipe (last night’s dinner), since I used up the bell peppers that I had for that recipe. Yum! Look forward to playing around with and fixing this again. Made before going to church on Christmas Eve. Popped it in the oven while opening presents Christmas morning so it was ready when we were. It was absolutely delish. Fed 4 adults with a small amount of leftovers that the in laws polished off this morning. Great, great recipe. Plan to make another to have for breakfast when I return to work. I made this Christmas morning. It was delicious!!!!!! I used 3 eggs and only a half cup of milk. Thank you for sharing this delicious dish with us! I forgot to mention that I didn’t add any cheese because I can’t eat diary. Sad I know!!! But it was still delicious without cheese. This was definately very easy! FYI – I misread the instructions and topped the casserole with the cheese before sticking it in the oven (rather than just the last few minutes) and it came out fine! I did, however, think that there was too much breakfast sausage. I might try with 1/2 lb and increase the hashbrowns to 2 cups. Or use bacon as others did. I made this for Christmas brunch. It was fantastic! Thank you for sharing! We tried this recipe for Christmas morning. It was easy and a bit hit. Thanks!!!! Made this for Christmas morning breakfast. It was a huge hit. I was afraid it wouldn’t be enough for 4 adults and 2 toddlers, but it was perfect! We also had a side of Irish bacon. This is such a versatile recipe that next time I’ll try adding a few other things such as mushrooms, ham or bacon and try with some different cheeses. Thank you! I’m baking this right now. I doubled the recipe and baked it in a 9×13 dish. does that mean I need to add more cooking time? It’s baked for 40 minutes but it doesn’t look ready. Thank you! This was excellent! I used leftover ham cooked up in a little leftover bacon grease instead of sausage..huge hit! I love how you compare the Bisquick version to your natural version of this recipe. I have also quit using baking mixes when cooking for my family. It took me lots of trial and error to come up with basic biscuit and pancake recipes I love, but it was worth the effort. Question: I always have potatoes in the house and like to make my hash browns using freshly shredded potatoes. When I do this my casseroles always turn a funky brown color because the potatoes start to discolor once they are shredded. Any advice there? This is great…I used to make a casserole that was topped with bisquick…i will attempt to make it using this replacement. Would also be good covering a baked beef stew. Thanks! Since I can’t find frozen hashbrowns without dextrose, I made my own when I had too many potatoes around last week. I scrubbed, then baked for 1 hr, then shredded ( in food processor) and put on a baking sheet in the freezer. Once frozen, I transferred to a bag and stored in the freezer. They turned out great when i cooked them a few days later and I was happy to have something to do with the extra potatoes! Could I changed the whole wheat flour to almond flour to make it primal/paleo? Hi there. We’ve not tried that substitution. Only two eggs (for 6 people) in your recipe? Can this be made ahead and frozen? If so would you freeze it before taking it out that morning to bake or would you bake it first and let it thaw and warm it up the morning you need it? Is there a reason for not draining the fat? I’d prefer not to keep it if I don’t have to. Hi Becky. It is for flavor and moisture but you can drain it if you choose. Can this be made ahead of time and then frozen? I would like to make it a week ahead of time and pull it out to defrost the night before and throw it in the oven on Christmas morning. Can this dish be eaten cold or does it taste better right out of the oven? Hi, Is there a vegetarian substitute for the sausages? Thanks! What is the best gluten free substitue for this recipe? I do a similar casserole without the flour/bisquick component that would work for the gluten free/paleo folk. Just add a couple more eggs and delete the batter mixture. It’s also good without the hashbrowns–just eggs, sausage, cheese, onions, and whatever other veggies you want to add. I overcook mine slightly because my family really, really likes the crusty brown edges. I have to be honest…this was pretty bad. Maybe it was my sausage but it was a greasy mess. After baking I poured about 1/4 cup of Grease off the top of the casserole. It was also extremely bland. Maybe if it was made with hot sausage (or additional spices) and the grease (or ar least half of it) was drained off prior to putting in casserole dish it might be something I would make again. I am sorry it didn’t turn out for you – I agree if the sausage wasn’t seasoned that would make a difference! I made this the night before and when I got it out of the refrigerator, it was black where some of the flour was. This ever happen to anyone? Is it some type of reaction with the whole wheat flour? Hi Nic. Yeah, potatoes can oxidize in strange ways but the flour was probably not to blame. Sorry that happened. It’s probably the starch in the potatoes. Sometimes potatoes can turn black when left overnight. Its no biggie…but that could be it. I love this recipe and have made it several times for family gatherings. I always get compliments. Recently I developed a severe intolerance to nightshade vegetables and can’t eat peppers. Does anyone have a good suggestion for a substitution? I feel like the peppers are the best part and wonder how it would be without them. Hi. My family loves adding mushroom. My son is not crazy about peppers. I would prefer small cubes of ham to sausage. Also, you could add most any veggie you’d like. Chopped tomato, cooked broccoli florets, etc. I am the college AEnglish professor who made up a seven day challenge based on your 100 days of unprocessed food. Most of my students can take the challenge by keeping a diary and telling me how they fared with their menus and meals. One of them totally misunderstood the challenge, skipped meals and was miserable. I could not believe she didn’t go on your site and get a clue as to how your challenge works. However, most of those who do the 7 day challenge rave about it. Just thought you would like to know how far reaching your idea is. My students come from all over the globe and hopefully they take their new found knowledge home with them.Love you and your girls and your great idea. I read (somewhere, sometime) that Bob’s Red Hill Unmodified Potato Starch is better for diabetics who need to watch their carbohydrate intake. Can I substitute this for one of the flours in the recipe? Also, how about the Stevia sweetener made for baking? Can this be substituted for sugars? I am trying to placate a diabetic husband who loves sweet carbs and whom does not yet accept that he must make some life style changes! Hi Tara. We’ve not made those kinds of substitutions. If you give it a try, let us know how your modified version works. I made an adapted version of this and it was WONDERFUL! I used just over a pound of bacon chopped instead of sausage. (I had already cooked and drained it, so didn’t add the extra fat.) I doubled the recipe in a 9×13 dish. 6 eggs instead of 4. Only had one bell pepper so I also added a zucchini. I had already made my own diced (sauteed) potatoes the day before so I threw those in instead of frozen hash browns. I also threw in some fresh rosemary and a few other seasonings since another review mentioned it was bland. I’m sure it would have been great without that addition though! So full of flavor. I was surprised how many veggies filled the casserole dish. I was a little worried my kids wouldn’t eat it being so dense with vegetables, but they ate it all up with delight. This was a wonderful breakfast for dinner and I did the majority of the prep work while I made breakfast and lunch. This will be on my regular list. Thank You! Has anyone made this with home grated (fresh) potatoes? I do not live where packaged frozen hash browns are available. Yes, I made it with grated potatoes yesterday. It was delicious! Hi there. We have never attempted to replace the eggs in this recipe but here is a similar recipe that might help: http://www.epicurious.com/recipes/food/views/sausage-and-potato-breakfast-casserole-4387. Thank you so much for this recipe. I can’t wait to make it for Christmas breakfast. I wanted to say that I make my own frozen hash browns by cooking potatoes that we organically raise in our garden until just a little less than done. Then I cool them, shred them in my food processor and spread them out on a baking sheet. I put them in the freeze for a couple of hours and then put them in zip lock bags. I can take out however many I need and cook them quickly in a frying pan just like the store bought hash browns. You could do the same with potatoes that you purchase at the farmers market in the fall when they are in season and reasonably priced. Love your website and your first book. I intend to get your second one after the Christmas rush is over. You keep me motivated to cook and eat healthy. Keep up the good work! Hi, this says only 2 eggs? 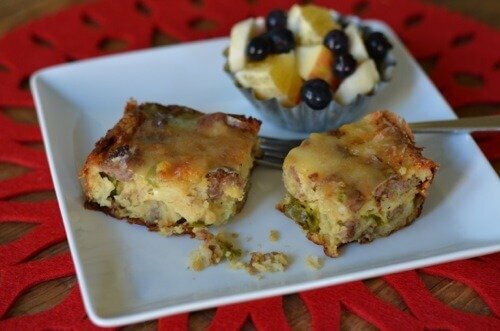 This is my most favorite breakfast bake ever! I make it every year for Christmas morning. I’m also making it for dinner tonight. It’s so versatile and easy to change up too. I have found it works really well with freshly grated potatoes or sweet potatoes. My whole family and everyone else loves it!